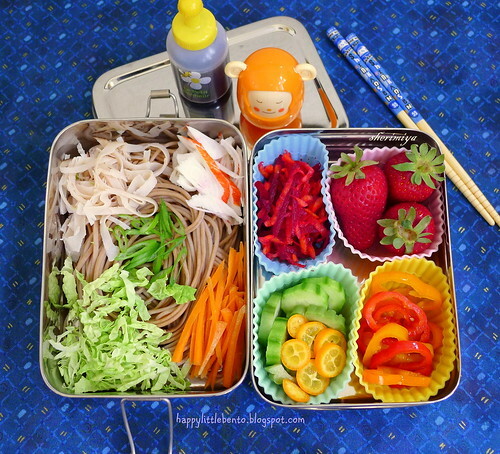 Soba EcoLunchBox Bento, a photo by sherimiya ♥ on Flickr. Our heatwave is cooling off, but I decided to pack the kids a refreshing soba salad for their bento in the EcoLunchBox two-tier set. Toppings include shredded lettuce, ham, carrots and surimi. He'll pour the tsuyu and sprinkle furikake right before he eats. Sides include: carrot-beet salad (tossed with cider vinegar, ground ginger, and pomegranate juice), pickled cucumbers with bittermelon and kumquats, and sesame-marinated baby sweet peppers. Plus the favored farmers market strawberries. Seems like a summer lunch, and I personally can't wait! Gloriously refreshing and so very pretty!